Preston North end are set to extend the contract of leading goalscorer Joe Garner. 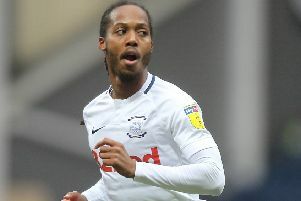 The 25-year-old striker signed an 18-month deal with North End in January. But manager Simon Grayson is set to activate a clause in his contract which gives the club the option to keep him for an extra year on top. Once the clause is triggered by North End, Garner will be tied to the club until the summer of 2015. He will join nine other members of the first-team squad who have all committed their immediate futures to PNE. This week, skipper John Welsh and midfielder Joel Byrom became the latest players to sign contract extensions – their current deals were due to run out next summer. They have followed Lee Holmes, Scott Laird, Paul Huntington, Jack King, Stuart Beavon, Keith Keane and David Buchanan, who have all put pen to paper on new contracts. Grayson said: “Joe has got an option in our favour and I am sure that will get activated in the next week or so. “So that will be another one which will be put to bed. “In terms of the club’s perspective, it’s good that we are recognising what these players have done for us recently. “This way we are staying one step ahead and not getting into a situation where you can find yourself with a lot of players out of contract in the summer. “Then you have to do all your re-negotiations and, before you know it, you could be fighting to get other players in that you don’t necessarily want. We do believe that we have got a good group here. The work ethic is good, the quality is good and we’ve got fantastic team spirit. “To renew those contracts was a no-brainer from my point of view. “They have been very good for me since I’ve been here. “Over the next few weeks there might be new additions whether it’s permanent signings in January or loan deals or extensions to other people’s contracts as well. “The last thing I want to be doing during the summer is to be having to sign 15 or 18 players and having a summer of just work, when it could have been done. Meanwhile, Grayson is expecting to utilise his full squad over the busy festive period. His hand is strengthened for today’s home encounter against Brentford with the return of Garner, who has been missing from the last three games through suspension. Loan man Paul Gallagher – also serving a suspension – will be available for the Boxing Day clash at Carlisle, while Jack King is nearing full fitness. “We have got a lot of games coming up,” Grayson said.